Brooke Averi, Jenna Ho, Rocky Vega, Jenna Ho, and Camrie Hewie in Anne of Green Gables Part I. Photo by Marina Peidad. BOTTOM LINE: Get your puffy-sleeved dresses ready, Anne Shirley has come to town! It’s always ambitious to theatricalize and reinterpret well-known stories, and there are few stories as well-known and beloved in children’s literature as Anne of Green Gables. The iconic redheaded orphan evokes warm memories and nostalgia for so many, which is why it was not too surprising to find a sold out house on a Monday afternoon performance. Like Anne, designer Cheyenne Sykes clearly did not have a large amount of money to work with for her set, lighting, and costumes, yet she was able to successfully craft a romantic landscape by carefully placing floral accents along white sheer curtains that drape and frame the stage. The curtains also serve a functional purpose as the backdrop for several projections. This worked particularly well with Sykes’ ingenious lighting design, in which the quick and thoughtful spectrum of colors pairs well with original music by Amanda Armstrong, Lars Jacobsen and Bart Kuebler, reflecting the moods and enhancing the actions of the characters. With regards to those characters, Rocky Vega’s performance is a tour de force. As the only speaking character, Vega embodies Anne, her adopted parents Matthew and Marilla Cuthbert, and all minor characters including the Barry family and Rachel Lynde. Transitioning from one character to another is difficult, particularly when performing a dialogue as a single actor, however Vega seamlessly switches from each role with definitive postures and vocal inflections, making it clear who she is speaking as and who she is speaking with. Vega’s performance is particularly admirable as all cues—dance, lighting, and music—rely entirely on her text, which she delivers flawlessly. One might think that, by casting Ms. Vega, a multi-racial actress, as Anne, director Chris Henry is taking quite a chance, considering that the iconic Anne is self-described as pale and freckled with red hair. During lengthy talks both before and after the production, Associate Artistic Director Jessica Wu confirmed the Royal Family’s commitment to diverse stories and casting. Their choice proves to be an excellent one, because Rocky Vega’s portrayal of Anne is exactly what it should be—starry-eyed, enthusiastic, and filled with joy. Accompanying Anne on her journey are four classically trained dancers—Brooke Avery, Camri Hewie, Jenna Ho, and Cindy Reid. The dancers are clad in traditional white dresses (ballet blanc), serving as Anne’s sylphlike Greek chorus. The dancers often personify Anne’s innermost feelings with silent sorrow or whimsy, as well as shadowing characters described through the text with whom Vega interacts. During one of the lighter moments, the four dancers surround Anne in four corners, bent over and bouncing casually, mimicking a horse and cart that carries Anne to Green Gables. While Anne of Green Gables: Part I can be described as a multimedia performance, in some ways it should not be. While projections of the moon in the night sky effectively create the serenity of Green Gables, there are a few times when projections of thoughts, feelings, and movements are superfluous and pull focus from the actual production. 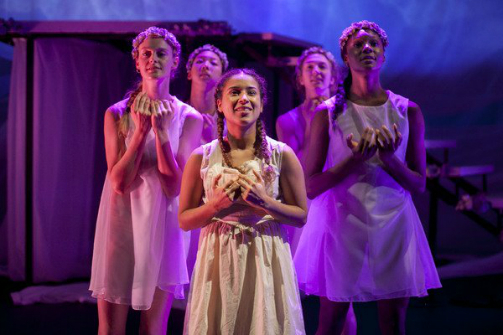 What the audience wants to focus on most is the story of a girl desperate to find a loving home after enduring years of hardship, through experimental portrayals of original text and dance. Although Anne Part I has closed, fans of Anne and experimental theatre will relish the Royal Family’s future productions of Anne of Green Gables Parts II-IV. Watch out world, here comes Carrots! Anne of Green Gables: Part 1 is adapted by Chris Henry, based on a book by L.M Montgomery. Directed by Chris Henry. Choreography is by Lorna Ventura. Set, Costume & Lighting Design is by Cheyenne Sykes. Additional Music is by Amanda Armstrong, Lars Jacobsen and Bart Kuebler. Sound Design is by Chet Miller and Megan Culley. Projection Design is by Chelsie McPhilimy. Stage Manager is Carolina Arboleda. Assistant Stage Manager is Cafega Haynes-Rodriguez. The cast is Rocky Vega, Brooke Averi, Camri Hewie, Jenna Ho, Cindy Reid. Understudy is Kira Player, Swing is Stephanie Young.